Set up your little one for potty training success by planning a special lunch or dinner complete with a Pull-Ups® potty training cake. Keep the party small - just immediate family - so there isn't too much pressure on your child, but be sure to make it exciting and very personalized. We’ve gathered some ideas to help you create a wonderful beginning to your potty training journey. To construct a Pull-Ups® cake, follow the method you would use to build a diaper cake. Start by rolling the Pull Ups® and tying them together with ribbon, which will help produce stiff layers and can be stacked into tiers. Keep in mind that Pull-Ups® are larger than the newborn diapers you would typically use in a diaper cake, so it will take fewer of them to make a cake, but they also need to be rolled well to maintain the shape. You can also alternate Pull-Ups® with real underwear to encourage your child’s transition. Once you have this basic structure, you can customize the cake to make your child especially excited and motivated to potty train. Take a look at some examples below! Favorite Character Cake. Does your child have a special TV, book or online video character that they absolutely can’t get enough of? Theme your Pull-Ups® cake with colored ribbons and stickers of the beloved character. 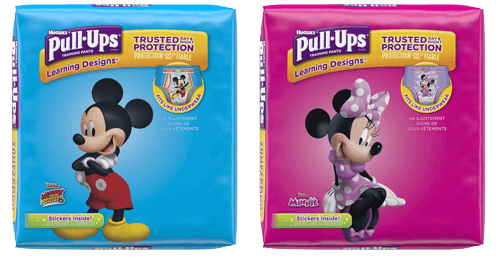 (Or base your cake on one of the wonderful Disney character designs on Pull-Ups® Training Pants!) You can also top the cake with a toy or new book from that character’s world. You can even make that small toy an incentive that accompanies your child to the potty. Animal Kingdom Cake. Craft a jungle themed Pull-Ups® cake. Wrap the tiers of Pull-Ups® in zebra, tiger and leopard print ribbons, which should all be easy to find in your local craft store. You can hang toy monkeys off of the layers and make a cake topper from artificial palm fronds and several toy or plush animals gathered together. Fairy Princess or Pirate Cake. If you have a child that loves to play dress up, channel that love of pretend play into a Pull-Ups® potty training cake. For a princess, think glitter and sparkly ribbons, wrapping the bottom in tulle, and topping it all off with magic wands extending out of the top. For a pirate, try stacking the Pull-Ups® in a toy pirate ship and place a jolly roger flag on top. No matter which theme you pick, crafting a Pull-Ups potty training cake will help your child feel special and look at potty training as a positive experience to be celebrated. Too many parents think of potty training as a dreadful chore, but this is a great way to incorporate fun and keep your children interested.